Ten feature length films plus a program of Made In Hawaii Shorts are on tap. The Palace has been a venue for HIFF films since 1999, when the Palace was reopened after decades of being closed. The Opening Night event was the Palace’s first HIFF Festival and featured a visit by Roger Ebert, nationally known film critic. “HIFF comes home to Hilo this year,” said Robin Worley, Palace Theater Executive Director. “Our Opening Night film ‘Moananuiäkea: One Ocean. One People. 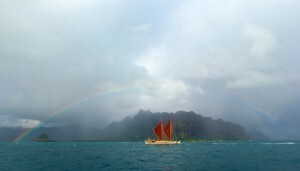 One Canoe‘ celebrates the historic Worldwide Voyage of the Hokule’a that connected countless communities from around the globe. A voyage that also represented the fulfillment of the vision of Nainoa Thompson and his contemporaries, the passing of the mantle to the next generation of kanaka maoli who will retain the skills of their ancestors and perpetuate this tradition for generations to come. When the voyage began, the Hokule’a departed from Hilo. An added bonus for Thursday, November 29 will be the addition of Beckie Stocchetti, Executive Director of HIFF. She will present the Opening Night film,” said Worley. 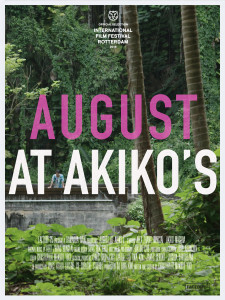 ” ‘August at Akiko’s‘ was filmed entirely on the Big Island with many scenes shot right here in the Palace Theater,” added Worley. “This drama follows a cosmopolitan saxophone musician who returns home to the Big Island after having been away for nearly a decade. He stumbles upon a Buddhist bed & breakfast run by a woman named Akiko. His wild sax and Akiko’s Buddhist bells form the base for a rich soundtrack that wraps around the audience like a sonic web surrounding the unexpected new friendship,” said Worley. Akiko herself will be in attendance to present the film. August At Akiko’s plays on Saturday 12/1 at 5:30pm. 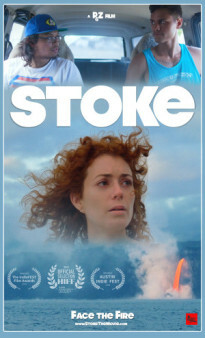 HIFF’s Closing Night Film ‘Stoke‘ is a road trip drama about a struggling tourist who hopes to alleviate her depression by seeing the Big Island’s active volcano. She enlists the help of two local guys who sell themselves as tour guides and the three find themselves in a series of misadventures on the road to lava. “‘Stoke’, like Hawaii Island is a little weird, but also life-affirming, especially for three lost souls who are trying to figure out what their next life moves will be. Sometimes it takes the mana of the land to steer you into the right path.” (Anderson Le, HIFF Artistic Director.) Co-directors Phillips Payson and Zoe Eisenberg will be in attendance at the screening on Sunday 12/2 at 7:00pm. “As the vanguard forum of international cinematic achievement in the Asia-Pacific region, Hawaii International Film Festival (HIFF) endeavors to recognize new and emerging talent, promote career development and original collaborations through innovative education programs, and facilitate dynamic cultural exchange through the cinema arts,” states the HIFF website hiff.org. “HIFF is unique in discovering features, documentaries and shorts from Asia made by Asians, films about the Pacific made by Pacific Islanders, and films made by Hawai`i filmmakers that present Hawai`i in a culturally accurate way,” continued the HIFF website. Regular Palace movie ticket prices appy, $8.50 for Adults, $7.50 for Seniors and Students with ID. Or buy a HIFF PASS for $35 and see all the movies! Tickets and Pases are available at the Palace Theater box office and with a credit card over the phone, 934-7010, 10am to 3pm.